Great Danes have special nutritional needs. 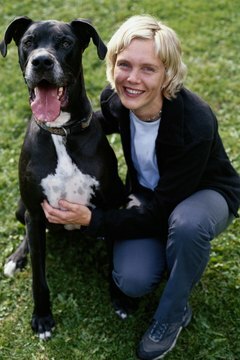 Giant breed dogs, such as Great Danes, have special nutritional needs. If Great Danes consume too many calories or other nutrients, they can develop skeletal problems and other health issues. Keeping these special nutritional needs in mind can help you find the right dry dog food for your Great Dane. Large breed dogs require fewer calories per pound than smaller breed dogs. As a result, overfeeding Great Danes can increase the risk of obesity and its related health problems. Because giant breeds are already at greater risk for physical problems, such as hip dysplasia, adding unnecessary pounds can increase the risks for orthopedic issues. Large breed formula dog foods are usually more calorically dense so dogs need to eat fewer calories to meet their nutritional needs. Like humans, dogs need vitamins and minerals for good health. However, studies have shown excess amounts of phosphorus, calcium and vitamin D increase the risk of skeletal and orthopedic problems, including lameness. According to the Merck Manual of Veterinary Medicine, dogs predisposed to these conditions are at greater risk of developing them if they consume too much calcium in their diets. On the other hand, the Purina Research Report says giant breeds are more vulnerable to calcium deficiency problems than are smaller breeds. The report suggests looking for dog foods that include 1 to 1.5 percent calcium. Great Dane owners often worry about the protein content in their dogs’ food. They share a longstanding belief that excess protein can cause developmental problems in giant breed puppies. However, studies have shown protein amounts have no impact on skeletal or orthopedic development problems. In fact, previous studies suggesting too much protein could be a problem for dogs did not control appropriately for mineral and caloric content – the two factors known to be significant factors to developmental problems in Great Danes. The Purina Research Report suggests giant breed dog foods get approximately 25 percent of their calories from protein sources. All dogs’ nutritional needs change as they go through different life stages. During the puppy years, growth and caloric content need to be controlled so dry dog food formulated specifically for large breed puppies should be fed during the first two years. At that point, an adult formula, preferably one designed for large breeds, can be fed. Finally, senior Great Danes frequently suffer from arthritis so switching to a senior formula that contains glucosamine and chondroitin or adding these ingredients as dietary supplements can help reduce their discomfort during their golden years. "Does Brown Rice, Carrots & Turkey Make Great Dog Food?" What Else Can Cats Eat Besides Hard Food?